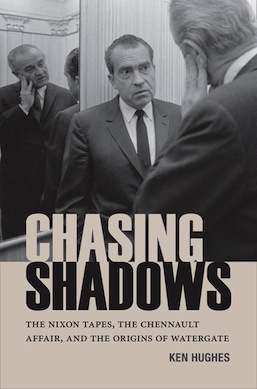 Ken Hughes’s Chasing Shadows quotes from several recordings secretly made during the Johnson and Nixon administrations. To further explore these remarkable conversations, readers may use the links below to access audio and transcriptions of the White House recordings that are excerpted in the book. These transcriptions and audio files are part of a larger online archive, The Presidential Recordings Digital Edition, published by the University of Virginia Press’s electronic imprint, Rotunda, in association with the Presidential Recordings Program of the UVA’s Miller Center. The Presidential Recordings Digital Edition is available for free trial and for sale to individuals as well as libraries and other institutions. For pricing or further information on access to the archive, please contact Rotunda Marketing Director Jason Coleman. Chasing Shadows: The Nixon Tapes, the Chennault Affair, and the Origins of Watergate, by Ken Hughes. University of Virginia Press, 2014. Ebook versions of Chasing Shadows have contextual links to the following conversations. For the convenience of readers of the printed book, all of the available conversations are listed below, in order of the page(s) on which they are quoted. Participants: Lyndon Johnson, Richard B. Russell Jr.